Join us for another fun filled evening at Parker’s Comedy & Jive @ Montecasino! Remember Biltong and Potroast? Well we are thrilled to announce legendary comedian Mel Miller will be joining us to tickle your funny bone. Well known singer/comedian and Elvis impersonator, Tony De King will get you up and rocking on the dance floor. 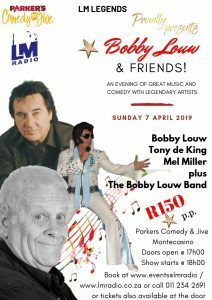 And of course our host Bobby Louw and his fantastic band with keep the good times rolling from start to finish! Don’t miss this one! Can’t wait to see you all there! Discount on large group bookings available. PreviousPrevious post:We want YOUR feedback! NextNext post:Liberty Radio Awards ’19 – Most Loyal Listeners Finalist!